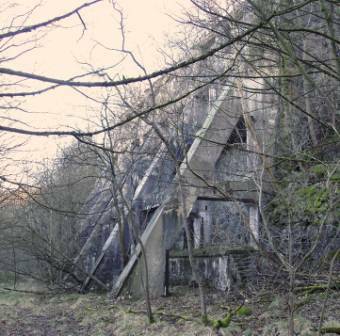 In 1891 Buxton Lime Firms Limited (later Buxton Lime Industries Limited) was formed and from then the Company supplied an ever increasing amount of high purity limestone and lime to the Brunner Mond Company, until in 1918 Buxton Lime Firms was finally bought out by Brunner Mond. 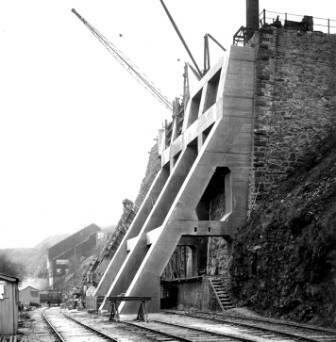 Development of the current works at Tunstead did not commence until 1929. 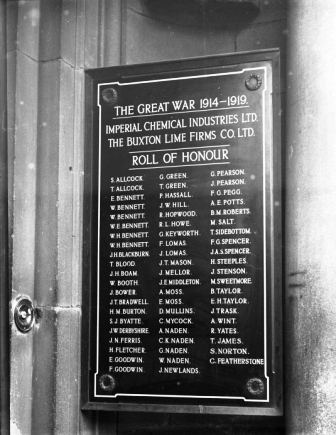 As a result it needs to be remembered that the men commemorated on the Buxton Memorials worked not at the present site but a number of sites under the Company umbrella, e.g. Cowdale Quarry, shown below - working on the left, and as it appears today above the Dale, near the A6. Of the above Great War names, 20 appear on the Town War Memorial, The Slopes, Buxton. These are highlighted in blue above. The Service details for these men can be accessed using the alphabetical names index at the top of the page, or by clicking on the highlighted names in the above table. N.B. On the Slopes memorial - Sweetmore is spelled Sweatmore & Howe is spelled How. S. Allcock; J.H. Boam; W. Booth; J..T. Bradwell; S.J. Byatte; J.W. Derbyshire; P. Hassall; R. Hopwood; D. Mullins; G. Pearson; J. Pearson; M. Salt; T. Sidebottom; E.H. Taylor; J. Trask & R. Yates. The names of: S. Allcock; T. Allcock; J. W. Derbyshire; H. Fletcher; J. W. Hill; G. Keyworth; J. Newlands and A. E. Potts can also be found on the Doveholes War Memorial. Similarly, the names of R.J Adams; J.P. Belfield; J. Goodwin; F. Gyte; L. Howell; J.F. Lobley; C. & G. Penneystone and A.L. Tebb, from the World War 2 Memorial also appear on The Slopes Memorial. N.B. 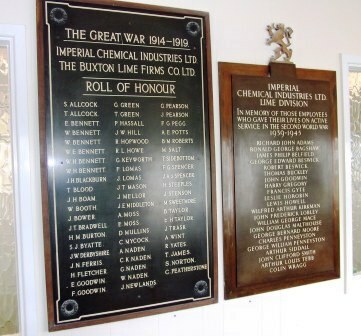 The 61 names from The Great War (and 11 of World War 2) on the Buxton Lime Works Memorial that are not on the main Buxton Memorials, are not currently covered in this site, as time goes on, however, it might be possible to extend the site to include them. I am very grateful to Lafarge Tarmac for making the above photos available to me from the BLI archive. 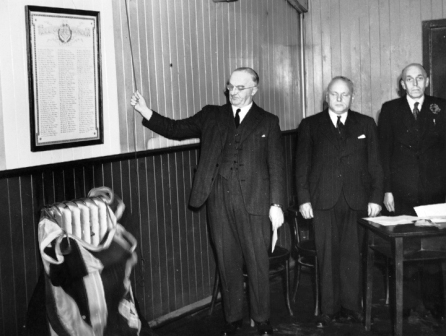 Service was held annually at the Spring Gardens' Offices. on the 11th April 1939. 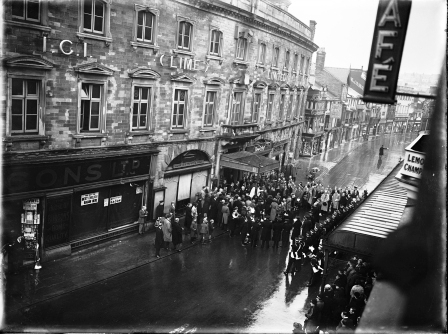 (below left), with the Second World War Plaque in the foyer (below centre). Harpur Hill Recreation Club. (below right). doorway at the original location. 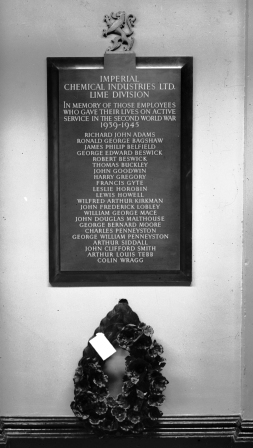 The Second War Memorial joined in the 1940s. 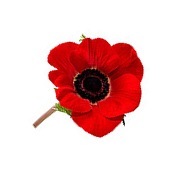 The Great War Memorial is in the form of a rectangular metal plaque in a wooden frame. The plaque has a single white line border and a wreath in relief at each corner. The inscription is in white lettering. The inscription on the World War 2 Memorial is also in white lettering and a rectangular protrusion at the top is surmounted by a lion rampant. 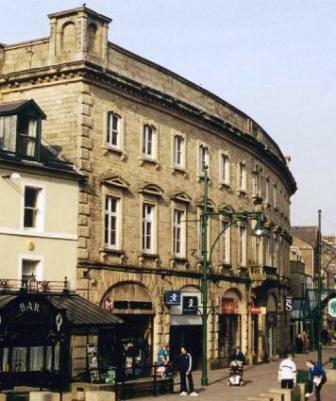 The photos below show the Company's former Offices in Spring Gardens. 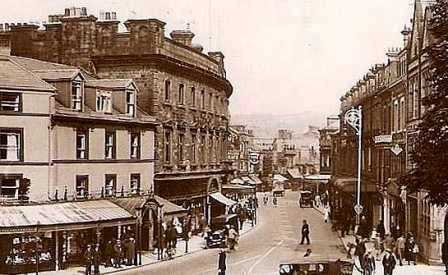 The building was originally built as The Royal Hotel for the 6th Duke of Devonshire in 1851. The picture on the left is from an old postcard, dated 1910. The one on the right is more recent, c. 2010.